The Charge Controller takes the power made by the solar panels and transform the ‘solar panel power’ into a form of power that the batteries can use. Finally, for this blog post you're reading right now, we have a calculator that will help you choose a charge controller. I HIGHLY recommend reading this post to truly learn how to use the calculator, but if the calculator is all you're looking for, you can download that HERE. How does the Charge Controller Work? Solar panels typically put out a voltage that is too high for batteries to use. If you have your solar panels wired in series like I recommend, you could possibly have over 100 volts coming out of the solar panels. If you connected your 100 volts from the solar panels directly to the battery, it’s not going to work. The Charge Controller regulates the voltage from the solar panels back down to the 12.6 – 14.6 volts that the batteries can store/use. 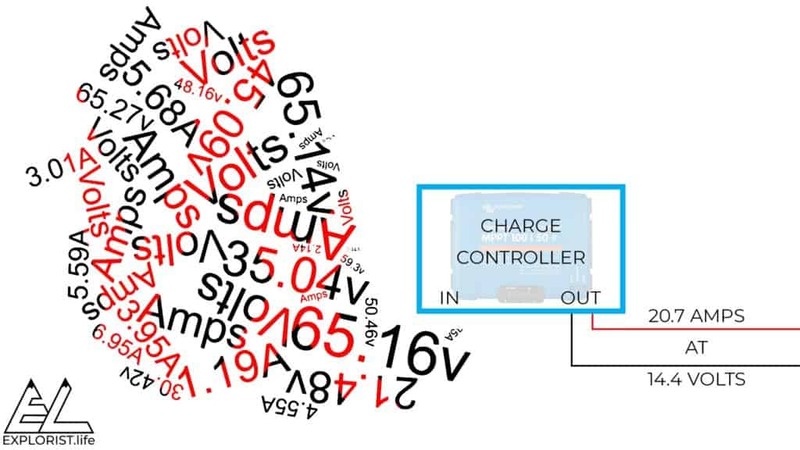 Charge Controller regulates the voltage from the solar panels. There are two main types of charge controllers. They are MPPT and PWM. 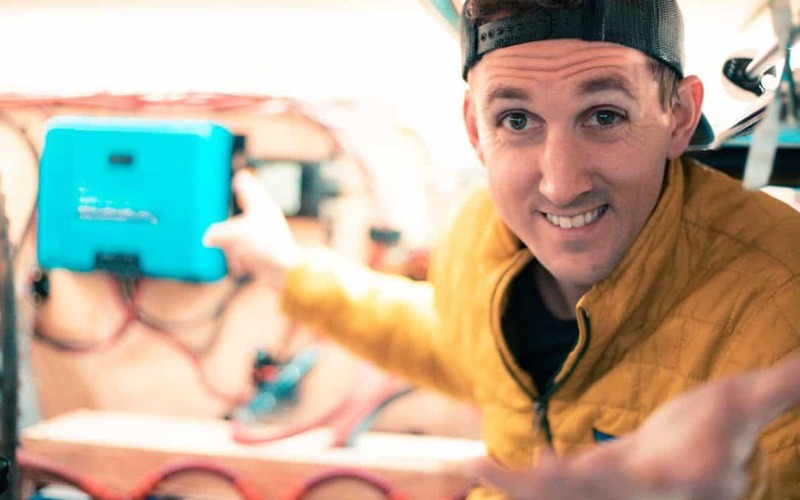 This blog post is a crash course in solar design and getting into the specifics of the differences is out of the scope of this blog post. Here’s what you need to know regarding MPPT vs PWM charge controllers MPPT is the newer, more efficient technology. From here on out, any time I talk about charge controllers, I will only be talking about MPPT charge controllers as I want to guide you to build a high-end, expandable solar setup. WHAT DO THOSE NUMBERS MEAN?!? Lets use the Victron SmartSolar MPPT 100 | 30 for example. The 1st number, 100 means the maximum input voltage the controller can handle. In other words, the Victron SmartSolar MPPT 100 | 30 can handle a max of 100 volts coming from the solar panels into the charge controller. The 2nd number, 30, represents the max amount of amps the controller can output going INTO THE BATTERIES. Let’s say, for example, you have 4 x 100 watt solar panels with the following stats. Since they are wired in series, the voltages get ADDED together for a total of 86.4 volts. 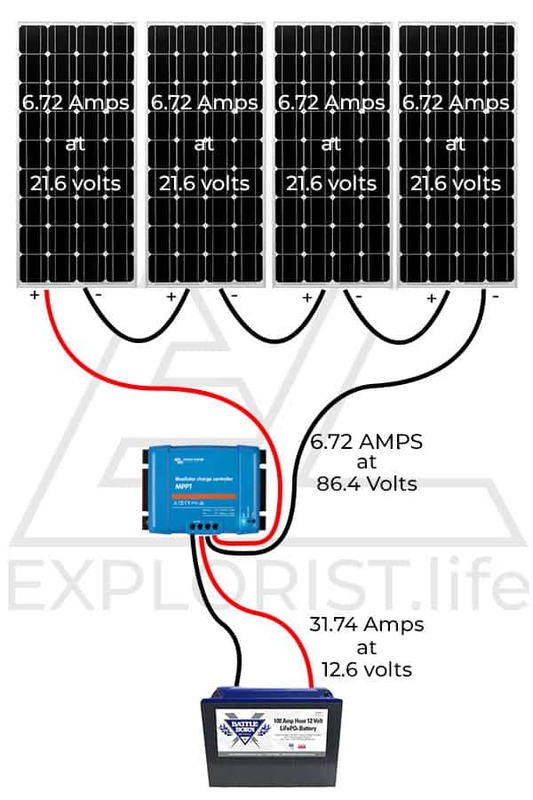 (Open-Circuit Voltage (Voc) of 21.6 x 4 panels) The amps on the “upstream” side of the 100w solar panels remains 6.72 since in series, the voltages get added and the amps stay the same. So, the 86.4 volts is under the safe threshold of the 100 max volts of the Victron SmartSolar MPPT 100 | 30 solar controller. 100 is the first number. What about the 2nd number, 30? We have 4×100 watts of solar panels totaling 400 watts of solar. This means, that at 400 watts and 12.6v we can expect up to 31.74 amps coming out of the solar controller. 400 watts / 12.6 volts (Battery) = 31.74 amps coming out of the charge controller. Now, we are talking about that Victron SmartSolar MPPT 100 | 30, we have to compare that 2nd number, 30. It's always good practice to trust manufacturer specs and recommendations. AND… If you happen to go ‘over' on your Amperage, it's not that big of a deal in terms of damage. It'll just be lost power that the controller won't convert. So, basically, the Victron SmartSolar MPPT 100 | 30 is pretty perfect for those 4 x 100 solar panels. But what if you like playing it safe? What if you want some wiggle room? Great! Size up to the Victron SmartSolar MPPT 100 | 50. Sure, it's a little more money, but if it's worth your piece of mind to have an extra 20 amps available to you, go for it. DID YOU KNOW… As temperatures drop, solar panels actually put out MORE power. Totally honest though, the math gets messy, SO I made a calculator that you can input all of the values for your setup so YOU can see how temperature affects your solar panel setup AS WELL AS will give you a recommendation on what solar controller you need taking solar panel temperature into account. Based on the inputs, you now have a recommended charge controller size that takes temperature into account. Sure, it says “Solar Controller 100 | 40” which is formatted like the Victron charge controllers, but you can, ultimately use any charge controller brand you like. The premise is mostly the same. Now… a Victron SmartSolar MPPT 100|40 doesn't exist. All you have to do, is simply round up to the next nearest available size, which would be the Victron SmartSolar MPPT 100|50. Confused? Don't want to do math? Here is a list of solar panel combinations with my recommended Victron solar controller size. I've picked these combinations assuming you'll never be somewhere with a daytime high of colder than -10 degrees Fahrenheit. Hi. Wonderful website with a lot of incredible information. I have 2 6V golf cart batteries in my trailer and want to upgrade to solar power. All solar controlers show 12V and 24V. What solar controler would you recomend for 6V batteries? You will likely be wiring your two 6v batteries in series effectively making them 1 12v battery. From there the same rules as any other 12v battery apply. Good info but, your charge controller wizard won’t work on my iMax and what about wiring panels in parallel to avoid shading issues? So not sure why you recommend series. I just checked on a mac and it’s working fine for me. It’s on google drive so make sure you aren’t trying to open it in microsoft excel or something. Regarding series vs parallel for your panels: I recommend series over parallel because the increased voltage allows for smaller and fewer wires which makes installation easier as well as (and maybe more importantly) the increased voltage allows the MPPT solar controller to fully do it’s job and have plenty of voltage to make the most amount of amps possible at any given time. You should design your system so you have no shading and if you have a bad panel, it should be replaced. Ya lost me, Nate. Your first diagram w/ 4 solar panels (and the preceding paragraph) talks about 6.72 A, but immediately below that image and subsequently, you talk about 5.29 A. Is that an oversight or my ignorance? Oops! Good catch. That was an error on my end as I switched example panels halfway through writing this. It SHOULD be fixed now. I may want to upgrade the system I am designing at a future date with more panels. If I buy a more powerful charge controller than I need today will I lose any efficiency and if so how much? For example lets say that I need a Victron 150/45 but buy a 150/60. Any other downsides to buying more powerful charge controller than I need today? Very little (if any) efficiency will be lost. I’d highly recommend buying for your plan of future expansion like you’re talking about. I have two panels of 160 each for total of 320 watts. The optimum voltage of 22.8 volts and 8.6 amps. So In series I get 45.6 volts and a measly 7.01 amps. Shouldn’t I wire them in parallel to increase the amps? I have two 6v agm’s in series and a blue sea MPPT 100/50 charge controller for future upgrade.